February 16, 2012 08:26 ET | Source: MDN Inc. Editors' Note: There is a map associated with this press release. MDN Inc. ("MDN") (TSX:MDN) notifies its shareholders that African Barrick Gold plc (ABG), the project operator of the Tulawaka gold mine in Tanzania in which MDN has a 30% participating interest, announced fourth quarter and annual operational results. The mine's total gold production for the year was 84,101 ounces compared to the 60,134 ounces achieved in 2010. The increased gold production level resulted from a greater proportion of the mill feed coming from the underground higher grade ore and fewer lower grade materials from the stockpiles than in 2010. In the fourth quarter the West Pit extension was progressed in order to provide incremental mill feed replacing the existing low grade stockpiles and supplementing the underground operation. Gold ounces sold were in-line with production and up 31% on 2010 reflecting the increased production. They were able to successfully extend the mine life twice at Tulawaka in 2011, through to the end of 2012; and the ongoing drilling programmes are focused on extending this further. 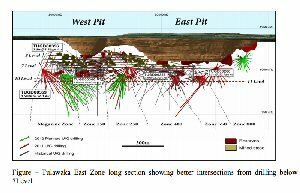 Much of 2011's focus was on the East Zone Underground extensions where they continued to extend the known high-grade mineralised shoots below 7-Level, down to 12-Level, indicating potential to extend the mine life further. 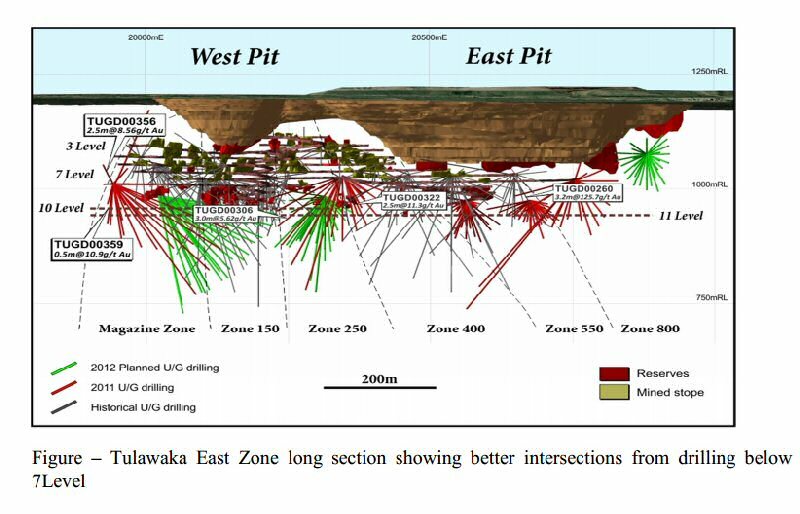 Drilling to date indicates that existing mineralised zones continue to at least 180 meters below the floor of Tulawaka's now-completed open pit.